This entry was posted on February 4, 2014 by Paul. Golfing legend Bernard Gallacher is the latest high profile sportsman who owes his life to the timely intervention of an automated external defibrillator along with someone properly trained to use it. The former Ryder Cup captain suffered a sudden cardiac arrest as he was about to give a speech at an Aberdeen hotel in September last year. Bernard Gallacher’s experience mirrors that of former Bolton footballer Fabrice Muamba who had a cardiac arrest while playing against Tottenham Hotspur at White Hart Lane in 2012. Again, an AED saved his life. 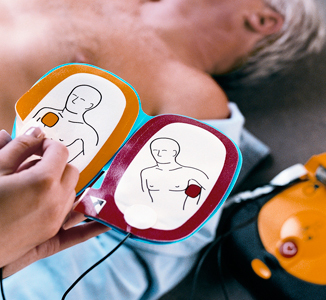 The use of AEDs will be one of three key topics that will feature strongly in this year’s high popular programme of free events that we will be hosting at top-class venues around the country. ‘AED – a Matter of Minutes’ will emphasise how early intervention can make all the difference between someone living and dying following a cardiac arrest. Other topics also already inked in on our free seminar agenda are Reasonable Adjustments and Flexible Working – both important subjects for employers looking to improve both their worker protection and productivity. Further subjects will be added later. Invitations will be issued a few weeks prior to each event. If you decide you would like to attend, please reply quickly. Tickets are always issued on a first come, first served basis and are usually all taken up well before the event date.